A mere few days ago, we saw the tragic story of a two lions that were killed after a man threw himself into their den. Now, a similar story has broke. At the Cincinnati Zoo, A four-year-old child curiously climbed the railing and found himself inside a moat with three gorillas. Two of them left the area after being called by staff, but one, named Harambe, did not. The chilling video footage shows the boy inside the moat, being picked up and dragged by the 400 pound gorilla while surrounding people can be heard screaming to call 911. The boy’s mother, whose name has not been released, can be heard saying, “Mommy’s right here. Mommy loves you,” and then says, “Isaiah be calm,” as the boy can be heard crying. 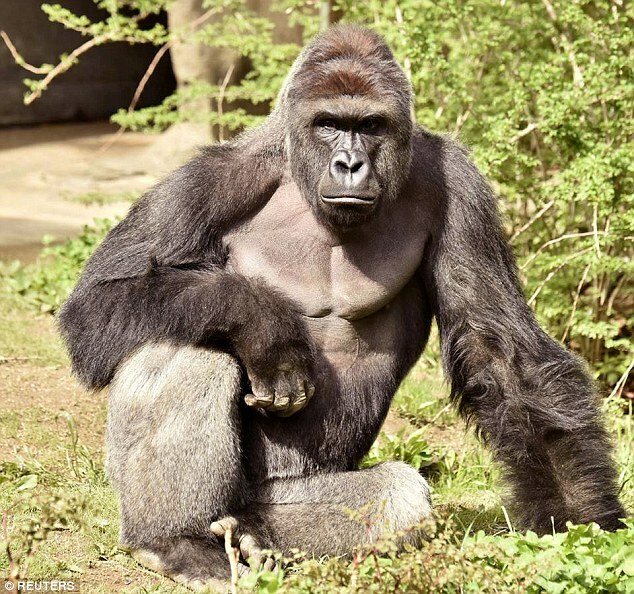 Harambe did not appear to attack the young boy, but the zoo felt they had no choice as it was a life-threatening situation. Now, those who knew Harambe mourn his loss, as it was a life taken too soon. Just one day prior, the beautiful animal had just turned 17 years old. RIP Harambe. See how the public are pointing fingers at the child’s parents for the whole ordeal here. In a shocking update, Harambe is seen nurturing the young child and showing no aggression towarsd him at all. See the footage here. Adele’s “Hello” In Reggae Style… You’ve GOT To Hear This!